Below are adjustments Reba and I made and settled on for Kat before we finalized a line connecting the axis points on the ground with flour. 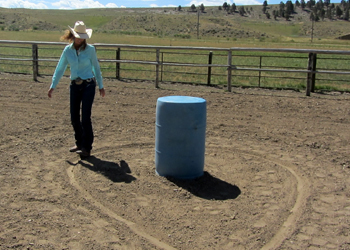 We had to adjust the points (and line) one more time once mounted because as it turns out, what feels right when walking the pattern, seemed to vary a bit when horseback. 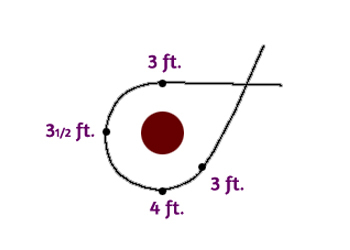 The second barrel is unique in that we have the shortest run to it, we run directly into a wall usually in close proximity to the barrel, with the most extreme angle of the three turns, and the longest distance through the turn – all contributing to it being the most challenging turn and commonly tipped barrel. 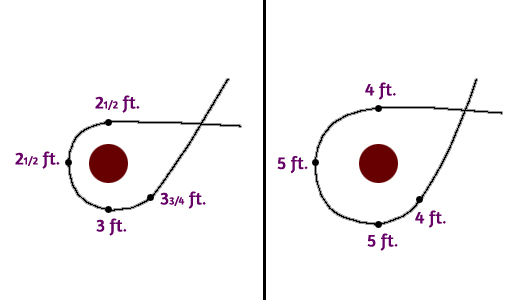 My personal preference is to allow for just a hair more room through and on the backside of the turns (as evident in my initial measurements). This is in part because it’s what seems to work best for my current personal horse, Pistol – who is BIG! 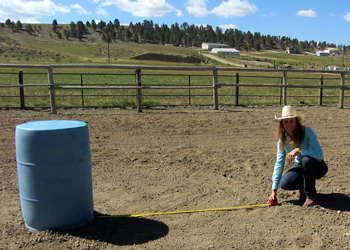 Your horse’s size and style might influence the footfall you decide on. With that said, always keep in mind that a horse’s movement patterns (HOW he uses his body) are only partly innate and are often even more so a product of his environment (training and conditioning). In other words – never underestimate the influence you have over how your horse uses himself, or rule out the possibility for creating positive change! While it’s never my intention to teach a horse a footfall pattern in slow work that will be different in a run, it’s also my experience that things DO tend to tighten up a bit with speed. Also, while consistency leads to confidence in horses, you may occasionally need to consider making adjustments to where and how you guide your horse based on the specific event conditions. 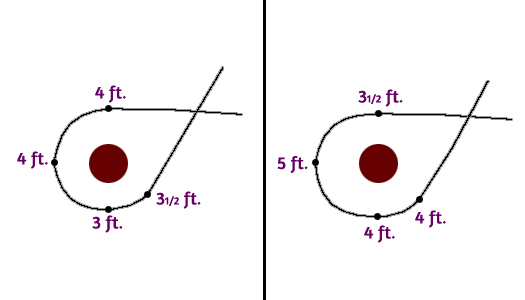 For example, a short distance between the first and second barrel might require you to over turn the first in order to be prepared for the second. Once Reba and I made adjustments, marked the path in the dirt then laid down flour, we each took a spin on Kat to test ourselves. 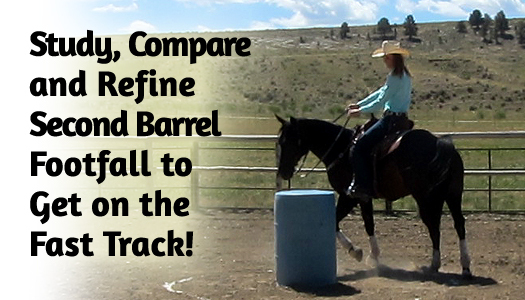 Staying perfectly on the track is more challenging than you might expect! 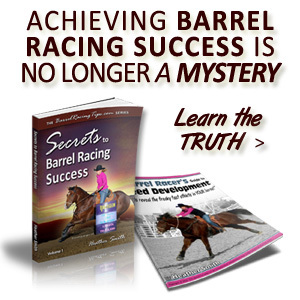 For one, it’s really a test of your horse’s responsibility – you’ll know pretty quickly how well HE knows his footfall. Second, when you have to make a quick but subtle correction, you’ll know whether your responsiveness needs brushing up – how effective can you be in an INSTANT!? Remember if there’s a delay in response going slow, there will be a much bigger one at speed! Of course, it doesn’t seem like rocket science to guide a horse on the pattern at a walk, but as you know, doing so precisely in a run is another story entirely. 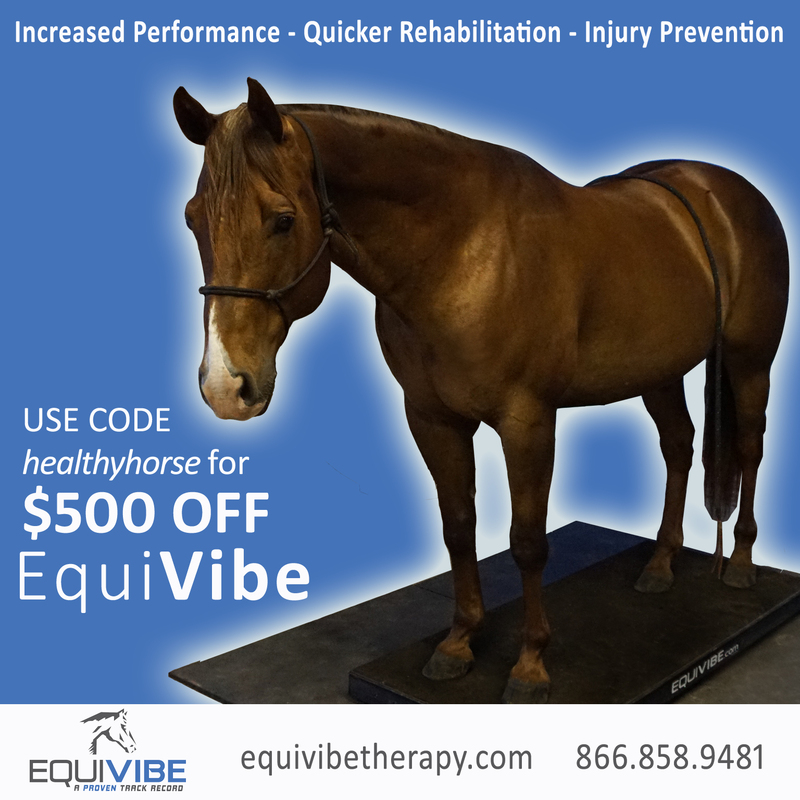 Our horse’s ability to stay on track will depend on our ability to accurately guide him with feel and timing. 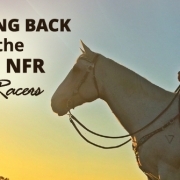 Responsibility – If you plant your rein hand on the withers and guide your horse only with your focus and subtle body language, does he stay on track or veer off? Responsiveness – Can you can correct and reposition your horse in an instant (less than a second) when necessary, primarily with your legs? 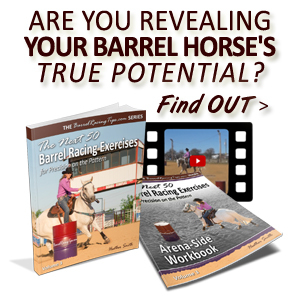 Riding – Do you subtly guide your horse smoothly, and fluidly through the turn (using your seat to encourage reach) – or blast into the hole then abruptly pull their head around? 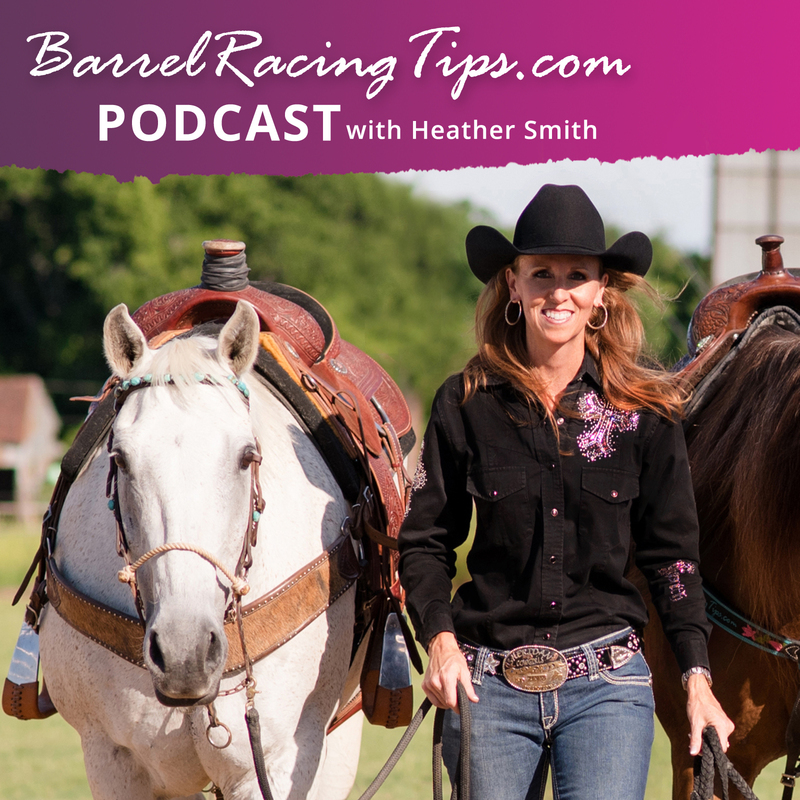 A horse that gets off track, but pushes against rein contact, through leg pressure, or doesn’t respond in a timely manner when a correction is attempted isn’t RESPONSIVE. 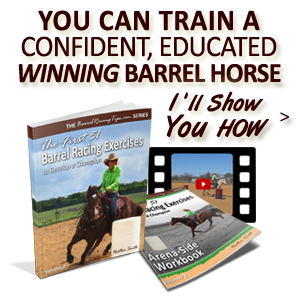 Getting a horse to work perfect circle drills in dry work, doesn’t to much good when they are roughly sling shotted in and out of the turns by the jockey. RIDE & GUIDE smooth to be FAST! 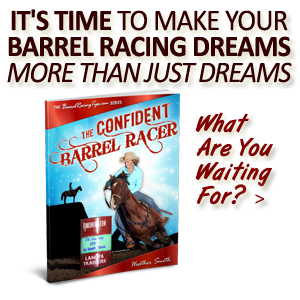 I can’t say enough how valuable and eye-opening this measuring, comparing and flour-laying process is at ALL barrels – whether you’re a barrel racing newbie or an ol’ pro. It’s easy to do, but it’s also easy not to do. But when WE are 100% sure and confident in our own mind and body about where our horse’s feet must be, HE will better understand his job, and we’ll both be able to perform more confidently and correctly, which means FASTER! It’s exciting to realize what could be the ACTUAL cause of delays on the pattern you may have otherwise struggled with over time and not quite had complete success resolving. Aren’t AH HA moments amazing? I LOVE having them, and I love facilitating them for others! 6. Walk it again horseback staying perfectly on the path you drew – are any adjustments necessary? 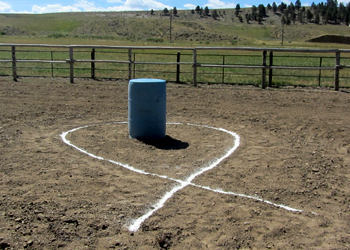 *When you and your horse are confidently staying perfectly on track, test yourselves by making a run on a pattern marked with flour. Study your tracks – where do you stay on path or get off track? Are there any other adjustments to make? Is it a Responsiveness, Responsibility or Riding issue? Report back in the comments below! Huge eye-opener! Definitely going to try it!